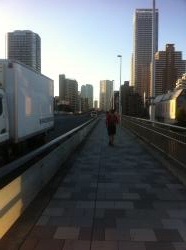 To get to used to a night run, I did a TOKYO Marathon course run with my husband, last night. I like to wear a cycling top, it's comfortable and handy with zip and pockets behind. 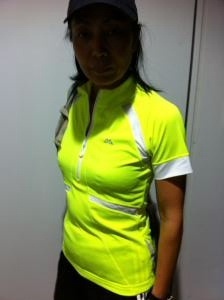 This yellow one is from Kathmandu store and it became my favorite. so we supposed to run 9 km longer than a full marathon distance. at 23:23, we headed out. Run through the night, run through out Tokyo city. Because of the not-so-accurate navigation, we ended up running 57 km all together. 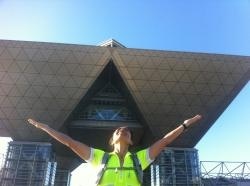 The finishing line is at the Ariake TOKYO BIG SIGHT. at 06:10, We finally made it. It was a beautiful run.